The Earth's ocean-atmosphere system was experiencing a weak El Niño during March 2019. The upper-level circulation was quite active this month, with the long-wave pattern shifting from a long-wave trough in the western contiguous United States (CONUS) and a long-wave ridge in the East, to a long-wave ridge in the West and trough in the East. Short-wave troughs migrating through the jet stream flow complicated the overall pattern and the transition between long-wave patterns. The upper-level troughs and their associated fronts and surface lows brought rain and snow along their paths, but the dominant storm track left a ribbon of above-normal precipitation across the CONUS from California to the central Plains, into the Midwest, and ending along the Mid-Atlantic Coast, with below-normal precipitation to the north and south. For some of the weather systems, the surface lows and fronts, and dynamics of the associated upper-level troughs, were strong enough to generate outbreaks of severe weather, with the preliminary tornado count for March well above average. The air masses were below freezing in the northern CONUS, which helped maintain an extensive snow cover there early in the month, but seasonal increases in sunshine and temperatures, along with lack of precipitation in some areas due to the storm track, contributed to a gradually decreasing snow cover area as the month progressed. Cloudiness associated with the fronts and lows, along with frequent incursions of cold and dry Canadian air masses directed southward beneath a northerly flow at the upper levels, resulted in monthly temperatures that were colder than normal for most of the CONUS. In Alaska, however, where an anomalously strong upper-level ridge dominated, temperatures were record warm for the month. Continued drier-than-normal conditions in the South and parts of the Northwest increased drought and abnormal dryness in those areas, but with above-normal precipitation falling across many of the western drought areas, the national drought footprint contracted to about 5.4 percent of the U.S. The upper-level circulation, temperature, and precipitation anomaly patterns suggest that the weather during March reflected the combined influence of atmospheric drivers originating in the equatorial Pacific Ocean, North Pacific Ocean, Arctic, and North Atlantic Ocean. See below for details. In the Northern Hemisphere, March is the first month of climatological spring, marking the early transition from winter conditions to the warm season. Spring is the time of year when solar heating increases with the rising sun angle, arctic air masses are not as cold, and a contracting circumpolar vortex forces the jet stream northward. Polar air masses influence the weather over the contiguous U.S. (CONUS) less, and the warm, dry subtropical high pressure belts influence the weather more. The result is transient weather patterns are common during March, with (typically) increasingly warm (subtropical) air masses building from the south, typically interrupted by incursions of the cold, and sometimes frigid, polar air. 500-mb mean circulation for North America for March 1-6, 2019. 500-mb mean circulation for North America for March 7-13, 2019. 500-mb mean circulation for North America for March 14-31, 2019. 500-mb circulation anomalies for North America for March 1-6, 2019. 500-mb circulation anomalies for North America for March 7-13, 2019. 500-mb circulation anomalies for North America for March 14-31, 2019. March 2019 was typical in some ways yet atypical in others. The upper-level circulation was very active, with several short-wave troughs and closed lows moving through the jet stream flow (especially at lower latitudes — over the CONUS), but the pattern was highly meridional (especially at higher latitudes — over Canada). This allowed Pacific weather systems to traverse the CONUS, dropping their rain and snow, yet also enabled Canadian air masses to surge southward across the country east of the Rockies and keep monthly temperatures colder than normal. Snow cover was above average yet steadily declined in area as the month progressed. The long-wave pattern shifted back and forth in a complex interaction between the broad atmospheric drivers and the local influence of short-term weather systems. There are many ways the long-wave pattern can be sectionalized throughout the month. The following discussion breaks the pattern into three sections: a long-wave trough across central to eastern North America with a ridge over the southwestern CONUS and northwest Canada to Alaska (March 1-6); a trough in the west and ridge in the east (March 7-13); and the trough shifting back to the east with a strong ridge building in the west (March 14-31). Temperature anomalies (departure from normal) for the CONUS for March 1-6, 2019. Precipitation anomalies (percent of normal) for the CONUS for March 1-6, 2019. March 1-6: A long-wave trough was centered over eastern North America and extended into central North America (south central Canada and north central CONUS), with a long-wave ridge across western North America (Alaska and northwestern Canada, plus southwestern CONUS). Pacific weather systems and their associated upper-level short-wave troughs moved through the western ridge then across the CONUS. These systems brought above-normal rain and snow to California, the Great Basin, and central Rockies, bringing the CONUS snow cover area to the monthly maximum of 57.1 percent on March 5th. A large upper-level closed low moved into the Pacific Northwest and southwest Canada near the end of this period, splitting the western ridge in two. The month began with a cold front across the eastern CONUS. Weather systems tracked along the front, bringing above-normal precipitation to the Southeast, Mid-Atlantic States, and southern coastal New England, as well as severe weather to the Southeast. With the long-wave trough over eastern North America, a northerly flow at the upper levels directed cold and dry Canadian air masses into the Plains, Midwest, and Great Lakes. The western ridge helped keep the Pacific Northwest mostly drier than normal. Temperature anomalies (departure from normal) for the CONUS for March 7-13, 2019. Precipitation anomalies (percent of normal) for the CONUS for March 7-13, 2019. March 7-13: The upper-level pattern shifted, with a long-wave trough becoming anchored over the western CONUS; the trough kicked up a long-wave ridge over the eastern CONUS, and this eastern ridge shifted the downstream trough further east. In the meantime, a long-wave ridge continued over western Canada, resulting in what is known as a "split flow". Pacific weather systems and their short-waves weakened as they moved into the area of the split between the northern ridge and southern trough. But they intensified as they moved into the western CONUS long-wave trough, producing strong surface lows and fronts which tracked to the Great Lakes. These lows tapped Gulf of Mexico moisture as they migrated eastward, spreading above-normal precipitation across the Southwest to Ohio Valley. One particularly powerful low pressure/frontal system, which moved across the West to Great Lakes March 11-14, triggered severe weather in the Southeast and Ohio Valley on the 14th. The long-wave trough kept temperatures colder than normal in the West, while lingering Canadian air (from the previous week), and clouds and precipitation from the migrating lows, kept temperatures below normal across the northern and central Plains to East Coast. The building eastern ridge and a southerly flow brought near- to above-normal temperatures to the southern Plains and Gulf Coast states. But the track of the low pressure systems left the Gulf Coast and Atlantic Coast drier than normal. Temperature anomalies (departure from normal) for the CONUS for March 18-31, 2019. Precipitation anomalies (percent of normal) for the CONUS for March 18-31, 2019. March 14-31: After the strong low pressure system of March 13-14 tracked out of the CONUS, a persistent pattern developed in the upper atmosphere, with a large ridge over western North America and trough over the East. The ridge allowed temperatures to warm over the West. At first, Pacific weather systems were mostly deflected to the north into Canada by the ridge, and an upper-level northwesterly flow over central North America directed dry and cold Canadian air into the eastern CONUS, so most of the country was drier than normal. A few Pacific weather systems and short-waves managed to wiggle beneath the western ridge later in the period, but they were weakened and produced a ribbon of above-normal precipitation across just the West, central Plains to Midwest, and Mid-Atlantic region. However, a low pressure and frontal system intensified in the East at the end of the month. 500-mb mean circulation for North America for March 2019. 500-mb circulation anomalies for North America for March 2019. Temperature anomalies (departure from normal) for the CONUS for March 2019. Precipitation anomalies (percent of normal) for the CONUS for March 2019. The full monthly mean circulation pattern reflected a combination of the ridge west/trough east pattern, with short-wave troughs undercutting the western ridge over the CONUS. The monthly temperature anomaly pattern reflected the frequency and magnitude of the troughing — long-wave troughing in the east; the resultant strong upper-level northerly flow over central Canada which directed particularly cold air masses into the CONUS, especially during the first two weeks of the month; and Pacific weather systems moving through the ridge across the West. The precipitation anomaly pattern for the month (the wet areas) represented an additive result of precipitation from the individual frontal passages and low pressure systems, reflected as a ribbon of above-normal precipitation from California to the Ohio Valley. The dry areas resulted from the areas being missed by the storm track, the dominance of the western ridge (Pacific Northwest), and the northerly flow over south-central Canada and the north-central U.S. (northern High Plains, South, and East Coast). The circulation during this month was also reflected in severe weather, drought, and regional records. When daily temperature records are examined, the extreme cold outweighed the extreme warmth. Integrated across the month, there were 3,960 record cold daily high (2,297) and low (1,663) temperature records (as of April 4). This was almost 2.5 times the 1,608 record warm daily high (544) and low (1,064) temperature records. Even though the magnitude of the cold anomalies seemed large (some parts of Montana and the Dakotas were 9 degrees or more colder than normal for the month), March is a time of year when temperature swings can be huge. Some states in the Plains were colder than normal, but none ranked in the top ten coldest category. Parts of New Mexico had monthly temperatures in the top tenth percentile, but on a statewide basis, no states (in the Lower 48) ranked in the top ten warmest category for March. The exception was Alaska, which had the warmest March on record. Precipitation, on the other hand, was different. On a statewide basis, two states had a top ten driest March, including Montana (second driest) and Washington (fourth driest), while four others (in the Northwest, Gulf of Mexico Coast, and New England) ranked eleventh to 13th driest. Four states had a top ten wettest March. These wet states included Utah (third wettest), Colorado and Nebraska (each sixth wettest), and Nevada (ninth wettest). Temperatures averaged across the country gave the CONUS the 44th coldest March in the 1895-2019 record. The coldest air was centered in the northern to central Plains, which is mostly rural, but below-normal temperatures also spread into the more populous Midwest and West Coast. The heavily populated Northeast was also colder than normal for the month. Near- to above-normal temperatures were centered in the rural Southwest but also a little in the more populous Southeast. Colder-than-normal temperatures increase heating demand in the northern and central portions of the CONUS during this transitional time of year, so the national REDTI (Residential Energy Demand Temperature Index) value for March 2019 ranked as the 55th highest March REDTI in the 125-year record. March continued a wetter-than-normal pattern over areas in the West that were in drought or abnormally dry at the end of February, resulting in another month of welcome drought improvement. But dry conditions in March continued a dry pattern that has lasted at least the last three months in the southern Plains to Southeast Coast, and the coastal Pacific Northwest, so drought and abnormal dryness expanded in these areas. With contraction exceeding expansion this month, the national level drought area fell from 11.9 percent of the CONUS at the end of February to 5.7 percent of the CONUS at the end of March (from 10.7 percent to 5.4 percent for all of the U.S.). March began with about 44 percent of the CONUS covered in snow. Pacific weather systems, with their cold upper-level troughs, brought snow to the West, from California to the central Rockies, raising the CONUS snow cover area to its monthly maximum of 57.1 percent of the country on March 5th. With a northerly flow in the upper levels of the atmosphere guiding cold Canadian air masses into the CONUS, and weather systems tapping Gulf of Mexico moisture, each storm system left a blanket of snow in its northern reaches, but most of the new snow fell on existing snow-covered areas. The CONUS snow cover area steadily decreased from March 5th onward, due to warm (above-freezing) air being advected in the southerly flow ahead of each weather system, and ridging occurring during the last half of the month, as well as the seasonal increase in the solar angle — each day the noontime sun would get a little higher in the sky, increasing solar heating and melting a little bit more of the snow cover. A frontal/low pressure system at the end of the month lay down a new snow cover over parts of the central Plains, but by that time the snow cover area had contracted to 23.0 percent of the CONUS. Based on satellite observations, the monthly snow coverage across the CONUS was 1.06 million sq. mi. (2.75 million sq. km. ), 321 thousand sq. mi. (832 thousand sq. km.) above average, and ranked as the sixth biggest snow cover area in the 53-year record for March. Integrated across the month, snow cover was above average across much of the West, northern to central Plains, and Midwest to Northeast where upper-level troughs were dominant, surface lows tracked frequently, cold (below-freezing) air prevailed. The atmospheric circulation needed to create the instability and dynamics favorable for severe weather consists largely of a southwesterly flow across the central part of the CONUS, which funnels moist Gulf of Mexico air and its latent heat energy into the mix. Surface fronts provide additional atmospheric lifting. The changing direction of the circulation around surface lows and the upper-level troughs and lows above them adds spin to the rising air, which enhances the formation of tornadoes. During the warm season, solar heating of the ground creates convective currents which add to the instability of the air. During March 2019, at times long-wave troughs became established which set up a southwesterly flow across the central CONUS. Short-wave troughs moving through this flow intensified, creating divergence in the upper atmosphere which enhances upward motion and instability. With associated cold fronts pushing the air upwards, and surface lows creating convergence of air at the surface which also forces air upwards and enhances instability, the stage was set for significant outbreaks of severe weather. Most of the severe weather, including tornadoes, occurred in the southern Plains to Southeast and Midwest ahead of these weather systems. Significant tornado outbreaks occurred on the 3rd, 9th, and 14th. Based on preliminary data, there were 145 tornadoes in March 2019, which is well above the long-term average for March of 80. Typically tropical cyclone activity is enhanced in the Eastern North Pacific and inhibited in the North Atlantic during El Niños, and inhibited in the Eastern North Pacific and enhanced in the North Atlantic during La Niñas, due mostly to changes in vertical wind shear during the two extreme events. The relationship is unclear during ENSO-neutral events. Warm sea surface temperatures (SSTs) fuel tropical cyclones while vertical wind shear tears them apart. The tropical Pacific Ocean was in a weak El Niño state during March 2019. The Atlantic hurricane season runs from June 1st through November 30th and the Eastern North Pacific (ENP) hurricane season runs from May 15th through November 30th. No tropical systems developed in the North Atlantic, Eastern North Pacific, or Central North Pacific during March 2019. Two tropical systems developed in the Western North Pacific and affected the U.S.-Affiliated Pacific Islands (USAPI) (Micronesia). An area of convection, that developed in central Micronesia at mid-month, intensified into Tropical Depression 03W and moved across western Micronesia before dissipating after a few days. Another area of convection (Invest 97W) formed near the end of the month in central Micronesia (near Chuuk and Pohnpei) before dissipating after a couple days. Both systems mainly brought rain to the parts of Micronesia which they passed over, bringing relief from a building drought in the region. The upper-level circulation pattern during March, when averaged for the month, consisted of a ridge over the western CONUS extending across western Canada into Alaska, with above-normal height anomalies over the southern Plains to Southeast and from Montana to Alaska, and a trough across eastern Canada extending into the Ohio Valley, with below-normal height anomalies over eastern Canada into the Great Lakes, as well as over the eastern North Pacific off the coast of California. March 2019 ended up drier than normal in the Pacific Northwest to northern High Plains, southern Plains to Southeast, central Appalachians to New England, parts of the Great Lakes, and across Hawaii. The month was wetter than normal from California to the central Plains, across much of the Ohio Valley, and parts of western Texas and the Mid-Atlantic Coast. Alaska was wetter than normal except in the southeast and panhandle. Puerto Rico was wetter than normal in the west and drier than normal in the east. The ridge over western North American gave Alaska its warmest March on record, but the frequent troughing over the CONUS resulted in colder-than-average temperatures across most of the country. Monthly temperatures averaged near to above normal only in the Southwest and parts of western Washington and the Southeast. Northern Hemisphere monthly upper-level circulation pattern and anomalies (cylindrical projection). Northern Hemisphere monthly upper-level circulation anomalies (polar stereographic projection). Global Linkages: The upper-level (500-mb) circulation anomaly pattern over North America was part of a complex long-wave pattern that stretched across the Northern Hemisphere. The sinusoidal nature of the jet stream was evident in east to west couplings of ridges and troughs, and the height anomaly pattern indicated a highly meridional circulation, especially over North America and Asia. The mean and anomaly patterns suggested that the jet stream undulations took the form of three waves, or trough/ridge couplets, across the Northern Hemisphere — one couplet over North America (ridge west/trough east), another over the North Atlantic (ridge) and western Eurasia (trough), and the third over central Asia (ridge) and eastern Siberia to the North Pacific (trough). Below-normal heights across the Arctic joined the below-normal anomaly centers over the Bering Sea, western Eurasia, and eastern Canada. There was another interesting anomaly couplet at the mid-latitudes — above-normal height anomalies over the central North Pacific and below-normal height anomalies over the eastern North Pacific (off the coast of California). The upper-level circulation and its anomalies are associated with the Sea Level Pressure (SLP) pattern and its anomalies which reflect the semi-permanent centers of action of SLP. The above- and below-normal upper-level height anomalies appear to be associated with above- and below-normal SLP anomalies. During this time of year, storm systems usually congregate in certain favored areas, creating (on average) low pressure centers over the North Pacific (Aleutian Low) and North Atlantic (Icelandic Low). The North Pacific High and North Atlantic (Bermuda) High, which are normally weak and shifted further south during winter, are beginning to strengthen during spring. The location of the March 2019 SLP anomalies with respect to the long-term climatology suggests that the North Atlantic High was stronger and shifted further north and east compared to climatology, and the Icelandic Low correspondingly shifted further north. In the Pacific, both the Aleutian Low and the North Pacific High appeared to be shifted further west compared to climatology. During March 2019, above-average sea surface temperature (SST) anomalies continued to dominate the North Pacific, most of the Atlantic, and much of the Indian Ocean. The map of the change in SST anomalies from the end of February to the end of March showed warming off the coast of California associated with mixing of the surface ocean layers due to frequent passage of Pacific storms (and due to reduced coastal upwelling). The above-normal 500-mb heights were associated with upper-level ridging, or with weakened troughs, at the mid- and high latitudes; below-normal precipitation (over western Canada and southern Europe); below-normal snow cover (over Europe and Mongolia); above-normal surface temperatures (over Alaska, northwestern Canada, and much of Eurasia); and warm SST anomalies (over parts of the North Atlantic and North Pacific, especially off the coast of Alaska and western Canada). The areas of below-normal 500-mb heights were associated with upper-level troughing, or with weakened ridges; near- to below-normal surface temperatures (over southeast Canada into the central CONUS); cool SST anomalies (in the northern North Atlantic near Iceland and in the eastern North Pacific near the California coast); above-normal precipitation (over California, Scandinavia into northwestern Asia, and eastern Siberia); and above-normal snow cover (from southeast Canada into the north central CONUS). Parts of North and South America were cooler than normal, and some parts of the Atlantic, Pacific, and Indian Oceans had cooler-than-normal SST anomalies. But with all of Australia, most of Eurasia, and much of Africa and South America having warmer- to much-warmer-than-normal temperatures, and large portions of the Atlantic, Pacific, and Indian Oceans having warmer-than-normal sea surface temperatures, the March 2019 global temperature was still well above normal. Status: The ocean and atmosphere system reflected a weak El Niño state during March 2019. SSTs were warmer than average across most of the equatorial Pacific Ocean. Teleconnections (influence on weather): To the extent teleconnections are known, the typical temperature and precipitation patterns associated with El Niño during March include above-normal temperatures in the Pacific Northwest and Upper Mississippi Valley; below-normal temperatures across the Southwest, southern to central Plains, and Southeast to Mid-Atlantic region; near-normal temperatures across most of the northern Plains to Great Lakes; above-normal precipitation along the West Coast into the Southwest, Gulf of Mexico Coast, Atlantic Coast, and central Plains; and below-normal precipitation across the Ohio Valley to interior Northeast, and parts of the northern Rockies. Comparison to Observed: The March 2019 temperature and precipitation anomaly patterns agree in some areas but not others. Areas of disagreement are in the northern CONUS for temperature and along the Gulf and Atlantic coasts and Ohio Valley for precipitation. Status: The MJO Wheeler-Hendon index indicated that the MJO transitioned through phases 2, 3 and 4 during the first half of March, then became incoherent. Other aspects of the tropical ocean-atmosphere system (referred to in the CPC reports as the background or low frequency (or base) [e.g., La Niña or El Niño] state, and Kelvin and Rossby waves) also appeared to play a role in influencing the month's climate (especially Rossby waves and Kelvin waves) (MJO updates for March 4, 11, 18, 25, and April 1). In fact, during the last half of March, Rossby wave activity over the East Pacific, due in part to mid-latitude influences, appeared to disrupt both the ENSO and MJO signals. Teleconnections (influence on weather): The MJO's temperature and precipitation teleconnections to U.S. weather depend on time of year and MJO phase; there is also a lagged component associated with the teleconnections. To the extent teleconnections are known, the March (February-April) teleconnections for temperature are shown here and for precipitation are shown here. Comparison to Observed: The MJO is transitory and can change phases (modes) within a month, so it is usually more closely related to weekly weather patterns than monthly. In the case of March 2019, the monthly temperature anomaly pattern generally agrees with the teleconnections for phases 2 and 3. The MJO was only briefly in phases 2 and 3 (during the first week), and the temperature anomaly pattern for March 1-6 is a good match for the teleconnections. The very large cold anomalies during this week would weigh heavily in the monthly average, and thus would be reflected in the monthly temperature anomaly pattern. During the second week (March 7-13), when the MJO was in phase 4, temperatures warmed up a bit, somewhat reflecting the teleconnections. The monthly precipitation anomaly pattern does not agree with the teleconnections for any of the MJO phases, but the precipitation anomaly pattern for March 1-6 is a good match for the phase 3 teleconnections. However, the precipitation anomaly pattern for the following week does not match the phase 4 teleconnections. Status: The daily PNA index was negative during the first week of March, turned positive during the middle half of the month, then ended the month neutral (zero), and averaged near zero for the month as a whole. Teleconnections (influence on weather): No temperature, precipitation, or upper-level circulation teleconnections are provided for a neutral (zero) PNA. However, to the extent teleconnections are known, a positive PNA for this time of year (March on the quarterly teleconnection maps) is associated with below-normal upper-level circulation anomalies over the northern North Pacific and southern and central Plains to U.S. East Coast; above-normal circulation anomalies over western Canada into the Pacific Northwest; warm temperature anomalies over Alaska, Canada, and the Pacific Northwest; cold temperature anomalies over the southern and central Plains to U.S. East Coast; and above-normal precipitation in Colorado and Kansas, with below-normal precipitation in the Upper Mississippi Valley, although the precipitation teleconnections are few and weak. The teleconnections for a negative PNA are opposite to those for a positive PNA (i.e., replace below-normal with above-normal, and above-normal with below-normal, in the above descriptions). Comparison to Observed: The March 2019 monthly upper-level circulation, temperature, and precipitation anomaly patterns match the teleconnections for a positive PNA in some areas and negative PNA in other areas. 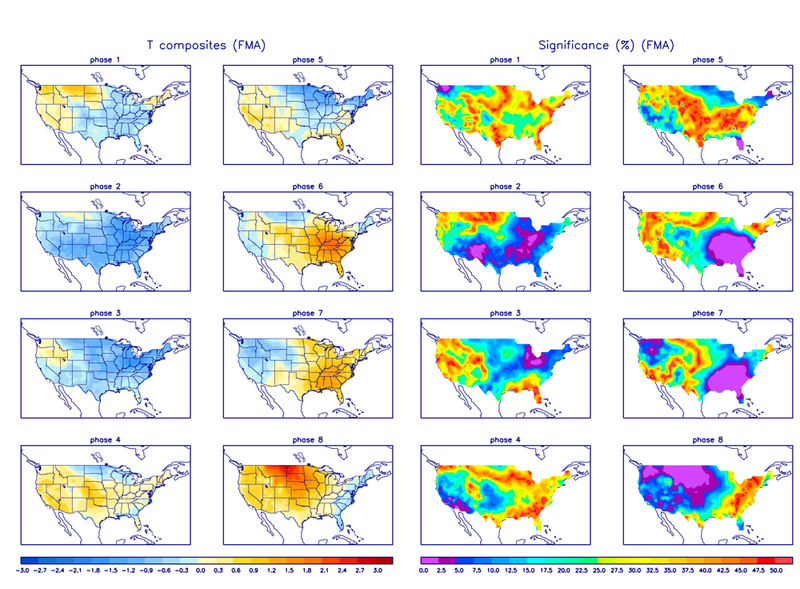 The observed circulation anomalies in western Canada match the teleconnections for a positive PNA, but in the southern and eastern CONUS they match the teleconnections for a negative PNA. The observed temperature anomalies match the teleconnections for a positive PNA in Alaska and northwest Canada but are a poor match for either a positive or negative PNA elsewhere in North America. The precipitation teleconnections aren't extensive enough to make solid conclusions, although the observed precipitation anomalies match the teleconnections for a positive PNA in Colorado and a negative PNA in the Upper Mississippi Valley. On a weekly basis, however, the observed upper-level circulation anomalies over western Canada, and the observed temperature anomalies over the southern Plains to East Coast, during the middle of the month are a good match for the teleconnections for a positive PNA during the days when the PNA was positive. Status: The daily AO index was positive throughout the month, and averaged positive for the month. The 3-month-averaged index was positive. Teleconnections (influence on weather): To the extent teleconnections are known, a positive AO in March (February-April in the AO Quarterly Composites table) is typically associated with below-normal upper-level circulation anomalies over the Arctic Ocean and northern Canada; positive upper-level circulation anomalies over the eastern CONUS extending across the North Atlantic to Europe, and most of the North Pacific; above-normal temperatures across most of the CONUS east of the Rockies; drier-than-normal conditions along the Southeast to Mid-Atlantic Coast, Kansas, and central California to Oregon; and wetter-than-normal conditions in western Washington and from eastern Texas to the Ohio Valley. Comparison to Observed: The March 2019 monthly upper-level circulation anomaly pattern is a good match with the teleconnections for a positive AO over much of the Northern Hemisphere, except in northwest Canada, Alaska, and the eastern North Pacific. 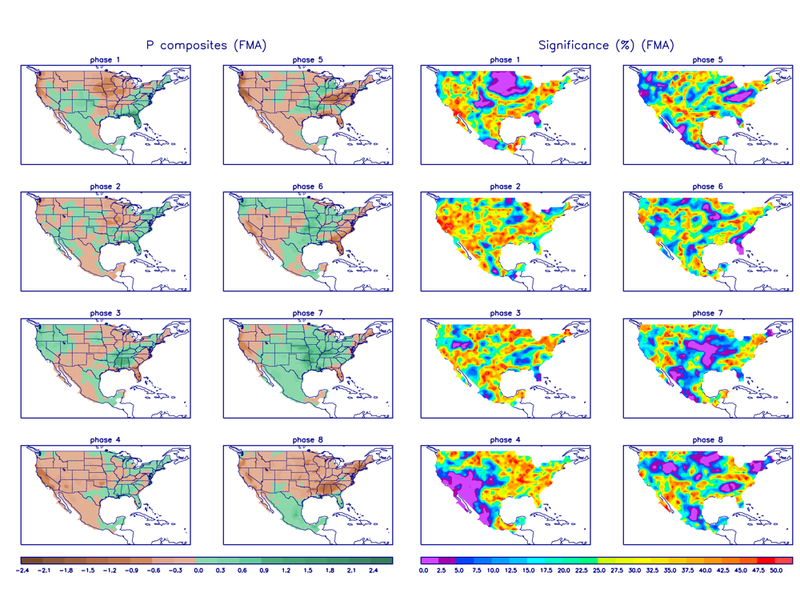 The monthly precipitation anomaly pattern matches in the eastern CONUS but not in the West. The monthly temperature anomaly pattern does not match. The only week the observed temperature anomaly (east of the Rockies) matched the positive AO teleconnections was near the middle of the month (March 10-16). Status: The daily NAO index was slightly positive for the first half of the month and strongly positive for the second half, averaging positive for the month. The 3-month-averaged index was positive. Teleconnections (influence on weather): To the extent teleconnections are known, a positive NAO during this time of year (April on the quarterly teleconnection maps) is associated with above-normal upper-level circulation anomalies across the CONUS, then across the Atlantic to Europe; below-normal circulation anomalies over northern Canada to Greenland; above-normal temperatures across the CONUS, except Texas to the Mid-Atlantic Coast where there is no correlation; and below-normal precipitation in the Southeast and parts of the central Plains and West. Comparison to Observed: The March 2019 monthly upper-level circulation anomaly pattern agrees with the teleconnections for a positive NAO, where they exist, over much of the CONUS, North Atlantic, Europe, Greenland, and northern Canada. The upper-level circulation anomaly pattern for the last half of the month (March 14-31), when the NAO was most strongly positive, is also a reasonable match over the CONUS, northeast Canada to Greenland, and North Atlantic. The monthly temperature anomaly pattern does not agree with the teleconnections, but it is a reasonable match for the last half of the month. The monthly precipitation anomaly pattern agrees in the Southeast, but not the Plains or West. Status: The monthly WP index was positive (daily index values are not available). Teleconnections (influence on weather): To the extent teleconnections are known, a positive WP during this time of year (April on the quarterly teleconnection maps) is typically associated with below-normal circulation anomalies over the western CONUS extending into the eastern North Pacific, and over eastern Siberia; slightly above-normal circulation anomalies over southwestern Canada and across the Gulf of Mexico; above-normal temperatures across southwestern Canada, across the northern Plains and Great Lakes, to the Ohio and Mid-Mississippi Valleys; below-normal temperatures over the southwestern CONUS; and below-normal precipitation in Washington State (but otherwise little correlation). Comparison to Observed: The March 2019 monthly upper-level circulation anomaly pattern is a good match for the teleconnections for a positive WP, where the teleconnections exist; this is also true for the last half of the month (March 14-31). The monthly precipitation anomaly pattern agrees where teleconnections exist (in Washington State), but otherwise there are few correlations to compare to. The temperature anomaly pattern does not agree with the teleconnections. Status: The March 2019 monthly EP-NP index was positive (daily index values are not available). Teleconnections (influence on weather): To the extent teleconnections are known, a positive EP-NP index this time of year (April on the quarterly teleconnection maps) is typically associated with below-normal upper-level circulation anomalies over eastern Canada extending into the adjacent northern CONUS, and over the North Pacific; above-normal upper-level circulation anomalies across Alaska, extending down the Canadian west coast to the western CONUS; warmer-than-normal temperatures across western Alaska and the U.S. West Coast; below-normal temperatures across eastern Canada and the CONUS east of the Rockies (except for the Southeast); above-normal precipitation over Wyoming and part of the Ohio Valley (but the teleconnections are few and very weak). Comparison to Observed: The March 2019 monthly upper-level circulation anomaly pattern is a good match for the teleconnections for a positive EP-NP over North America; this is also true for the last half of the month (March 14-31). The monthly temperature anomaly pattern agrees over Alaska and the CONUS east of the Rockies; this is true also for the first week (March 1-6). There are few precipitation teleconnections, but the monthly precipitation anomaly pattern generally agrees where they exist. Indices and their agreement with the temperature, precipitation, and upper-level circulation anomaly patterns, by time period (month, week, or other sub-monthly period). Examination of the available circulation indices and their teleconnection patterns, and comparison to observed March 2019 weekly and monthly temperature, precipitation, and circulation anomaly patterns, suggests that the weather during this month was influenced, in whole or in part, by all of the main atmospheric drivers. The equatorial Pacific was in a weak El Niño state. The precipitation anomalies agreed with the teleconnections expected with an El Niño in some areas but not others, and the temperature anomalies were inconsistent with the teleconnections. The MJO came on strong early in the month, but then became incoherent. The CPC concluded that mid-latitude drivers, acting through Rossby wave activity over the East Pacific, overwhelmed the influence of both the El Niño and MJO. The circulation pattern during March was very complicated and didn't fit any driver's teleconnections perfectly. The AO and NAO were a good match in most areas of the Northern Hemisphere, while the WP seemed to be driving the below-normal anomalies over the eastern North Pacific into the adjacent western CONUS, and the EP-NP appeared to drive the ridging over Alaska and western Canada and troughing over eastern Canada. The PNA may have helped with ridging in western Canada at mid-month, but otherwise the PNA was a non-player. For temperature, the MJO seemed to be influential during the first half of the month, but when it became incoherent other forces dominated during the last half of the month. The dominance of cold temperature anomalies east of the Rockies, and warmth in Alaska, seemed to be driven by the EP-NP. Precipitation is the most difficult climate variable to match to atmospheric drivers, as indicated by the frequent weak to no teleconnections; this is likely caused by the many ways precipitation can be triggered (frontal systems, short-wave troughs, etc.) and by a random factor (e.g., convective instability). The month began with the MJO appearing to have a strong influence on the precipitation anomaly pattern. But after the first week, competition from the various forces resulted in little bits of influence here and there at different times of the month. This month illustrates how the atmospheric circulation for the month can reflect the combined influence of all or most of the atmospheric drivers (or modes of atmospheric variability). NOAA National Centers for Environmental Information, State of the Climate: Synoptic Discussion for March 2019, published online April 2019, retrieved on April 18, 2019 from https://www.ncdc.noaa.gov/sotc/synoptic/201903.